Earlier this year Koki Eto (14-3-1, 10) impressed us all as he went to war with Thailand's Kompayak Porpramook and put on one of the most impressive performances of the year. Having traveled from Japan to Thailand for that fight Eto looked like the man who had been able to conquer the harsh Thai conditions. 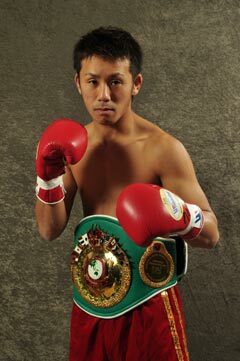 In the process of his victory over Porpramook Eto had claimed the WBA interim Flyweight title and become the first Japanese born fighter to claim a world title in Thailand. Earlier today however Eto got a real wake up call as returned to Thailand to make the first defense of his title and fought Yodmongkol CP Freshmart (33-2, 20). The fight started well for the challenger who applied intelligent pressure and looked like a man with a statement to make. He was forced to take some shots in return, especially to the body, though never looked bothered by them as he kept coming forward and kept landing the cleaner better shots. Despite the great opening round for Yodmongkol it seemed that the champion managed to find his way in to things in the second as his body attack become more notable. Unfortunate for Eto however it seemed that his shots simply couldn't discourage Yodmongkol who was landing heavy shots of his own. The heavy artillery of Yodmongkol rocked Eto hard in round 3 as the Japanese fighter was surprisingly shaken. It didn't take long for him to recuperate but it was still a shock given the fact he took the best shots of Porpramook with out ever looking shaken. By now it was plainly obvious that Yodmongkol hit harder than his record indicated and that Eto wasn't the same fighter who had fought Porpramook. Eto managed to finally have some success in round 5, his first round on my card, as his body shots began to connect on a regular basis. By the end of the round they appeared like they were taking their effect on Yodmongkol who slowed notably in the final minute or so of the round. Just as soon as Eto's fightback began it was over as he was dropped very early in round 6. He didn't appear that hurt but it was a clear knockdown from a hard left hook as Eto left himself open. The Japanese fighter was now in a big hole and he knew it as he attempted to over-come the knockdown and moved up a gear. Unfortunately for Eto much of his work was now becoming sloppy and rushed, missing by a mile and further tiring him out as panic began to set in. Amazingly round 7 saw Eto's work paying off as Yodmongkol did little more than cover up for large portions of the round. It suddenly looked like the Thai was tired and that Eto was about to turn it around. Unfortunately for Eto however his accuracy, or rather lack of, was destroying his own success as he missed time and time again. Eto's failure to really make the most of his opening in round 7 was repeated the following round as Yodmongkol was again conservative. Despite Eto throwing many more shots he was unable to clearly out land the Thai who was picking his spots excellently and landing the crisper and cleaner punches time and time again. Whatever had forced Yodmongkol to cover up in the seventh was no longer an issue. By the end of round 9 what ever mini-crisis Yodmongkol had been in was a distant memory as he took the best shots of Eto and landed his own in return. By now it was a case that Eto would need a knockout to retain but he had never managed to visibly hurt Yodmongkol who had managed to shake and drop Eto earlier in the fight. Although it was Eto needing a stoppage it was Yodmongkol who was looking like the only man likely to score one, as shown in round 11 as he repeatedly shook Eto. By now the only thing keeping the fight going was Eto's heart and toughness. The competitiveness had completely gone from the action and it started to become a beat down by the Thai. Unfortunately for the long term career of Eto he refused to go down and tried to fight back keeping the referee from calling a halt to the proceedings. The twelfth round saw Yodmongkol taking the decision out of the referees hands. The Japanese fighter was rocked again and this time when he tried to fire back he was caught by another shot scrambling his senses, one shot later Eto hard crashed to the canvas face first and out for the count. Having lost both his title, the WBA interim Flyweight title, and his senses it may be a very long time before Eto really recovers from this loss which was painful and career shortner. Against Porpramook Eto had looked like a busy, talented, tough fighter who could take it as well as he could dish it out and like a man who could box when he wanted and brawl when he needed. Today however he looked like a man who has forgotten the basics about the sport, forgot about breaking up his brawling with his boxing and looked like a man feeling over-confident. Whilst we could berate the accuracy and lack of boxing intelligence of Eto it seems much fairer to actually congratulate Yodmongkol. The 22 year old looks like he could b a very difficult man to take the title from. Like many top Thai's he looks very strong at the weight, very tough and has very under-rated technical skills. Sure he looks like he can be out boxed but he also looks like he can grind out many top fighters. This kid could well keep this title for a very longtime if he doesn't burn out.